Hypnosis is a state of mind where the conscious, wakeful mind relaxes, leaving the subconscious mind open to acceptable suggestions for change or improvement. Most people experience hypnosis as a sensation of deep relaxation that is pleasant and comfortable. In fact all of us go in and out of hypnosis states every day when we day dream and just before we fall asleep at night. Will I loose control when I’m hypnotized? No. The person being hypnotized is always in control. In fact, hypnosis will only occur if participants want it to happen. You can awaken from hypnosis any time you desire. You can’t be hypnotized to do anything you don’t want to do, so you won’t reveal any personal secrets or accept any suggestions which go against your ethics or morals. I’m not sure I can be hypnotized. Only a very small percentage of people cannot be hypnotized, including people on certain medications and those with a very low IQ. All that is required is average intelligence and a normal ability to concentrate. Will hypnosis weaken my will? No. Hypnosis is frequently used to strengthen a person’s will. Is it true that each time I am hypnotized it becomes easier for me to enter a hypnotic state? Yes! Just like everything in life, the more you do it, the easier it is. What if something happens to my Hypnotist during a session? Will I be stuck In Hypnosis? No. You would either fall asleep or wake up. Not unless you ask me to enhance your bird calling skills. For many years people have relied on hypnosis to help them with: Stress, Weight Loss, Motivation to Exercise and Make Healthful Food and Life Style Choices, Smoking Cessation, Habit Change, Limiting Beliefs, Pain Management, IBS, Personal and Business Relationships, Fears, Sadness, Test Taking and Studying, Alopecia (hair loss), Sleeping and more! The average person will see a hypnotherapist for 4 – 8 sessions per issue, although some people find that one session is all they need to get motivated and make the changes they desire! Results may vary per client. Below is some of the information I found when researching the benefits of hypnosis on stress management. Numerous research studies have identified hypnosis as an effective and efficient relaxation tool. These studies also indicate some of the health benefits that can result from hypnosis. 1. O’Neil, L., Barnier, J. & McConkey, K. (1999) Treating anxiety with self-hypnosis and relaxation Contemporary Hypnosis Vol. 16, No.2, pp.68-80. Subjects were divided into either a relaxation or self-hypnosis group. 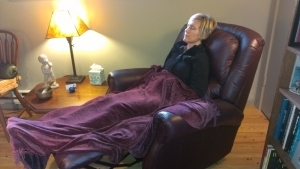 Both self-hypnosis and relaxation techniques successfully alleviated anxiety, but self-hypnosis was perceived to be the more effective of the two treatments and to have greater capacity to alter cognitive and physical experiences. 2. Kiecolt-Glaser JK et al. Hypnosis as a modulator of cellular immune dysregulation during acute stress. Journal of Consulting and Clinical Psychology 69 (4): 674-82. Aug 2001. kiecolt-glaser.1@osu.edu, analyzed the effects of hypnotic-relaxation training on cellular immune function during a stressful event. The results provide encouraging evidence that hypnosis-relaxation can reduce detrimental immune function changes associated with acute stress. 3. Stanton, H. (1993) Using hypnotherapy to overcome examination anxiety American Journal of Clinical Hypnosis Vol. 35, No. 3 pp198-204. Successful use of hypnosis in alleviating exam anxiety in medical practitioners who had previously failed their fellowship examinations. After two hypnotic sessions 10 out of the 11 medical practitioners passed their exams. 4. Gruzelier, J., Levy, J., Williams, J. & Henderson, D. l (2001) Self-hypnosis and exam stress: comparing immune and relaxation-related imagery for influences on immunity, health and mood. Contemporary Hypnosis Vol. 18 No. 2 pp73-86. In a study of medical students preparing for exams, subjects were divided into a control group and 2 hypnosis groups of which one was the ‘immune’ group and the other the ‘relaxation group’. Both hypnosis groups were given an induction. The immune group were given suggestions involving imagery of sharks or dolphins eating up germ cells. The relaxation group were given instructions of peace and happiness instead of the immune imagery. The students in the immune imagery group had significantly fewer illnesses during and after the examination period. 5. Gruzelier J et al. Cellular and humoral immunity, mood and exam stress: the influences of self-hypnosis and personality predictors. International Journal of Psychophysiology 42 (1): 55-71. Aug 2001. Evaluated the effects of self-hypnosis training on immune function and mood in medical students at exam time. Hypnosis involved relaxation and imagery directed at improved immune function and increased energy, alertness and concentration. The sizeable influences on cell-mediated immunity achieved by a relatively brief, low-cost psychological intervention in the face of a compelling, but routine, stress in young healthy adults have implications for illness prevention and for patients with compromised immunity.